Master craftsman David Beffa-Negrini sculpts a final piece for one of his Fool's Gold puzzles. David attended this year's annual AGPI Convention in Rochester, NY. This event was combined with the biennial Puzzle Parley (typically held every two years). Hundreds of puzzles (and games) were on display from several puzzle cutters and game collectors. Next year's convention will be held in Denver, CO from May 17-19, 2019. David attended this year's Sunapee Crafts Festival at the Mount Sunapee Resort. A great crowd as usual. Several new puzzle offerings this year! David Beffa-Negrini's Fool's Gold was highlighted in the December 2017 issue of New Hampshire magazine. On page 42, an article titled, "Puzzle Master" — Fitting in all the pieces can be charming or challenging. David attended this year's Sunapee Crafts Festival at the Mount Sunapee Resort. A great crowd enjoyed checking out his new puzzle offerings! David attended this year's Sunapee Crafts Festival at the Mount Sunapee Resort where New Hampshire craftsmen sold and displayed their wares ... from glass, pottery, furniture, etc. Dave, of course, presented and sold his Fool's Gold puzzles. This year the League put together a calendar for 2017. One of Dave's puzzles was featured for July. See the phooto above. To learn more about the League of NH Craftsmen, please visit www.nhcrafts.org. David attended this year's annual AGPC Convention in Princeton, NJ. He displayed and sold his Fool's Gold puzzles at the event. David crafted and displayed his Fool's Gold puzzles all day on Saturday, January 30, 2016 at the Exeter Fine Crafts store in Exeter, NH. Many folks stopped by to see him in action. Thanks to all who took the time out of your day to visit. David attended and sold his Fool's Gold puzzles at this year's Celebrate Nelson event. The craftsmen's show ran from 10 am to 2 pm. If you missed this one, put it on your calendar for next year! The fair showcases the work of some of the finest craftspeople in the country. Typically more than 350 craftspeople exhibit! To learn more about theannual League of NH Craftsmen please visit www.nhcrafts.org. David will be attending this year's annual AGPC Convention in Bloomington, IN. He will be displaying and selling his Fool's Gold puzzles at the event. David "set up shop" at the Exeter Fine Crafts retail store on Saturday, November 15 and demonstrated how he crafts his Fool's Gold puzzles. Many puzzles were available for sale and several folks stopped in for a close, upfront look at the process of creating and crafting puzzles! David attended the 12th Puzzle Parley Convention in Salem, MA in August. He spoke on the topic of "cutting oversized wooden jigsaw puzzles." One example discussed was a 4 foot by 4 foot maple leaf shaped puzzle he was commissioned to cut for a wedding ceremony. He also displayed and sold his Fool's Gold puzzles. 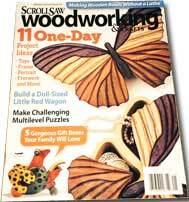 Fool's Gold was highlighted in the Spring 2014 issue of Scroll Saw Woodworking & Crafts magazine. "Behind the scenes with nine outstanding puzzle makers"
2014 marks the 30th anniversary of the Association of Game & Puzzle Collectors (AGPC). David served as the association's president from May 2006 to April 2011. 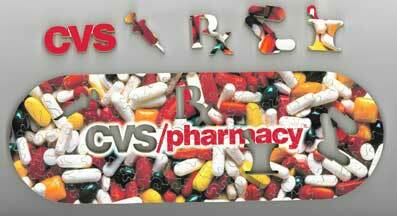 Currently he serves as the editor of the organization's Quarterly publication. To learn more about the Association of Game & Puzzle Collectors please visit www.agpc.org. on the topic of "Following Your Bliss"—how a former corporate executive of a Fortune 1000 Company turned his hobby of collecting and cutting jigsaw puzzles into Fool's Gold, a business offering fine handcrafted jigsaw puzzles. Fool's Gold puzzles gets a mention in Anne D. Williams' book, "The Jigsaw Puzzle." 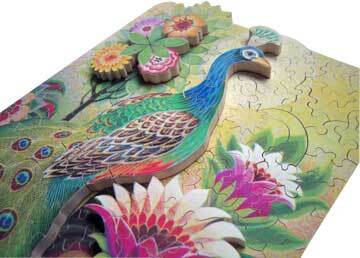 handcrafted wooden jigsaw puzzles made from the finest materials available. 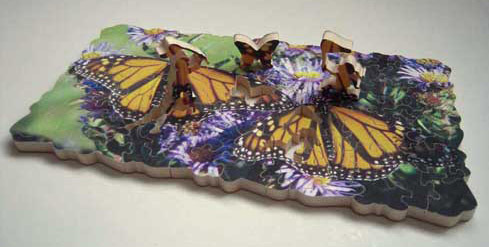 This partial view of a peacock puzzle was crafted as a two-layer puzzle. 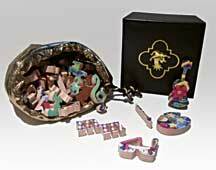 It is just one example of the variety of ways puzzles can be crafted. Irregular edges, drop outs, double layers, color-line cutting...a few tricks of the trade! Bob Askey's Mt. Whimsy artwork makes a great puzzle. This special edition features an irregular edge and nearly 200 tiny crafted houses (which after awhile all look the same!). It is a very challenging puzzle... and one of my hardest puzzles to date. This image doesn't show you the whole puzzle. Just dozens of the tiny houses! 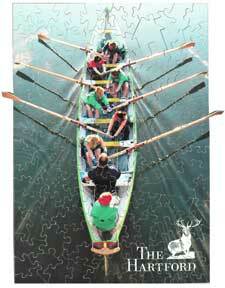 Approximately 325 pieces: 11" x 15"
Jigsaw Puzzles: Enjoyment All Year! No matter what the weather outside, from the heat of summer to the chills of winter, some of the best hours of the day can be had at a favorite table piecing together a jigsaw puzzle. Seems everything else just fades away...your only focus, the task at hand. Finding that next piece until the puzzle is complete. Yes, it's a good feeling, one of accomplishment, a smile upon your face. 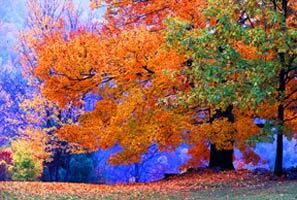 Wonderful fall image bursting with color! Click on the image to bring you to its related page and pricing information. 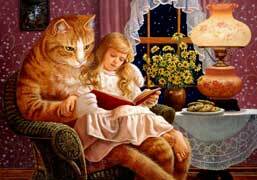 For the all cat lovers! Compare the Fool's Gold Difference! • Premium 5-star paper vs. ? • Double-thick veener backing vs. ? • No charge for "whimsies" vs. ? All Fool's Gold custom wooden jigsaw puzzles are individually handcrafted from a solid piece of 1/4" basswood, backed with a double-thick mahogany veneer. Ultra premium 5-star archival matte or luster paper is used for printing puzzle images, and after each puzzle is cut, the mahogany veneer back is hand-sanded, hand-oiled, and hand-waxed to give it a furniture-like finish. The finished puzzle is then packed inside a custom liquid gold lamé pouch and then fitted into a beautifully crafted black box made especially for Fool's Gold with its jester embossed on the top. 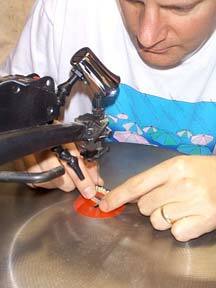 Compare these materials and processes to what other puzzle cutters use— typically a less expensive plywood, sometimes backed with a thin veneer, or none at all; varying degrees of printer paper; and tissue paper for inside packing material. For the cutting of the puzzles, Fool's Gold also uses the finest blades available—as tiny as .007" in thickness. 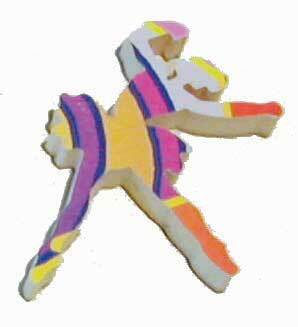 There is no extra charge for "Foolish Figurals" or "whimsies" (personalized pieces). And, as with all of our puzzles, no pictures are included of the final image! They are true puzzlers' puzzles! So have fun and explore the rest of this site to discover why Fool’s Gold puzzles are your best choice and the quality you deserve when looking for custom wooden jigsaw puzzles. 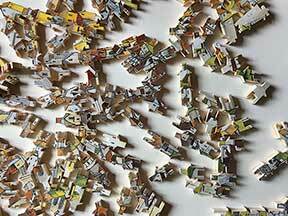 Hundreds of puzzles from more than a dozen artists. 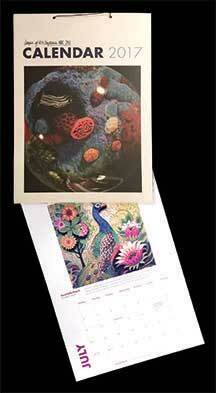 Click here for our ARTISTS section. challenging puzzle (as no final picture of the puzzle is included for the assembler). who seem to have just about everything! 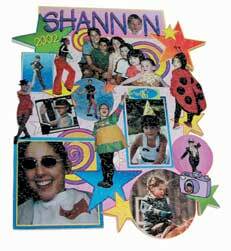 A perfect birthday gift for a Sweet 16 featured a number of different photographs that were scanned, modified, and then arranged to make a one-of-a-kind jigsaw puzzle collage. Click on the image for more examples of corporate puzzles crafted by Fool's Gold. Between a fine handcrafted wooden jigsaw puzzle versus today's standard cardboard variety, well, there is no comparison. Personalize your jigsaw puzzle with your choice of specially cut figure pieces—a starfish, cupid, frog, corporate logo, your name... whatever you wish!